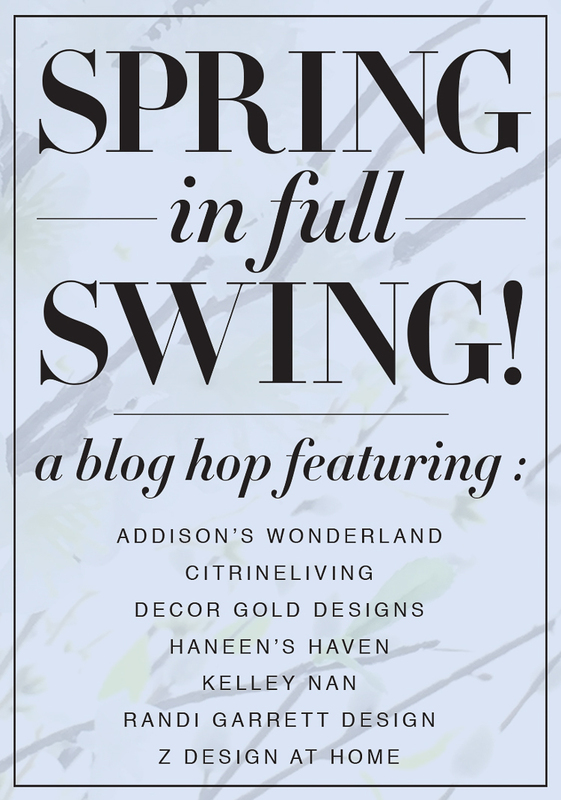 Welcome to Spring In Full Swing, a spring blog hop with some of my best gals! 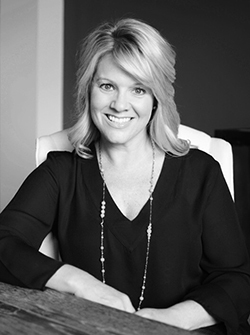 And a double welcome if you are coming over from my uber talented friend, Randi of Randi Garrett Design (on a side note, did you seen her recent kitchen remodel while you were on her blog? If not, make sure to go back and check that out real soon…I promise you’ll thank me later!). We are all so happy to have you taking the tour today and stay tuned at the bottom of my post for a short list of participating bloggers (plus one in particular) that I’ll be sending you on to for loads of home decor and spring inspiration this season! Friends, this is my 4th spring tour/hop this year so by now you can imagine that my home is oozing spring and I’m absolutely loving every single moment of it!! 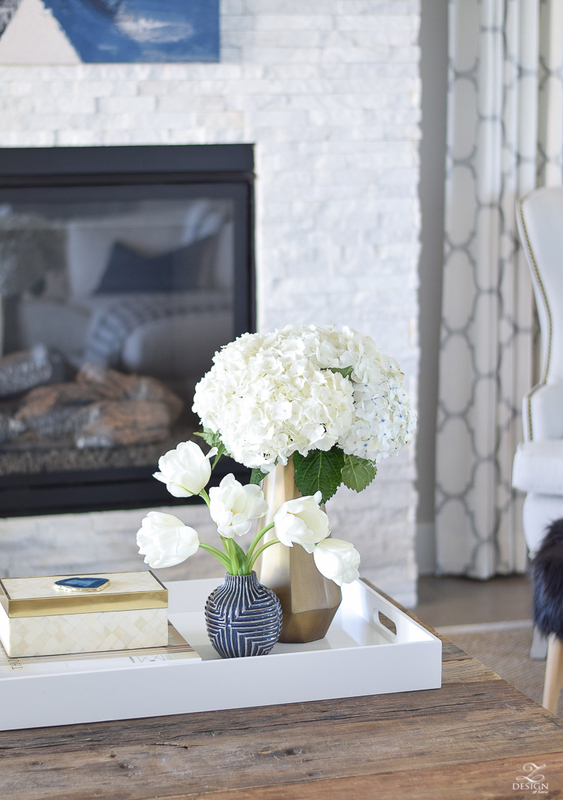 This is my favorite time of year to decorate as there are no heavy decor boxes to pull down from the attic and fresh flowers with pops of spring color abound all throughout my home. 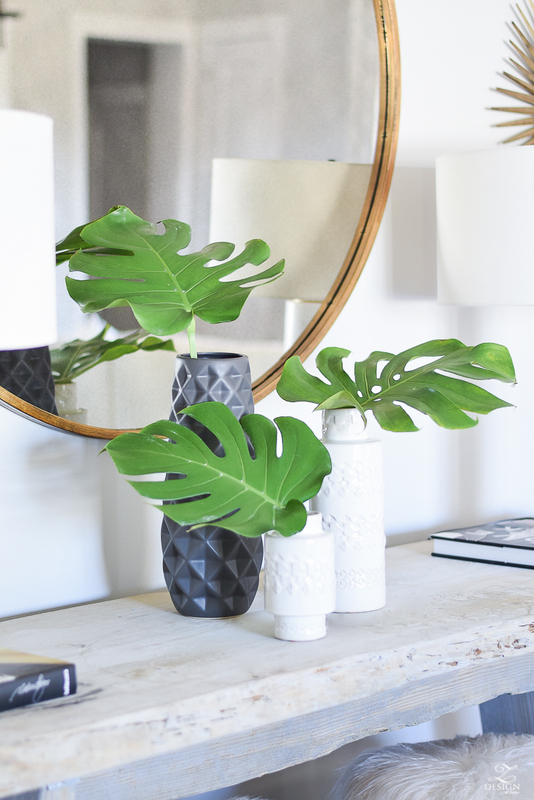 And last but not least, the newness of the spring season has us reflecting, decluttering, and enjoying a clean slate in our home which is always good. If you missed my first 3 tours…you can get caught up here, here & here. 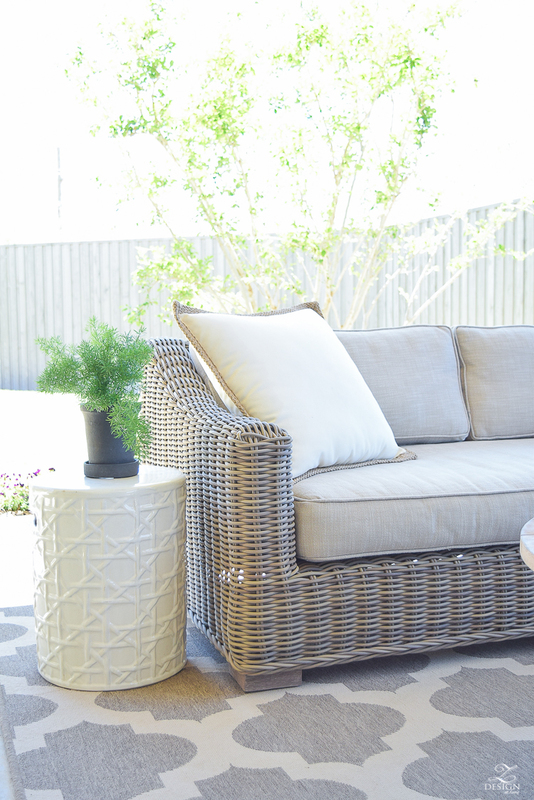 Today I’ll be sharing a fun spring recap with some additional photos of areas in my home that have evolved this spring plus a tour of our outdoor space where we are already spending lots of time relaxing and enjoying each other’s company as a family for the new season at hand! 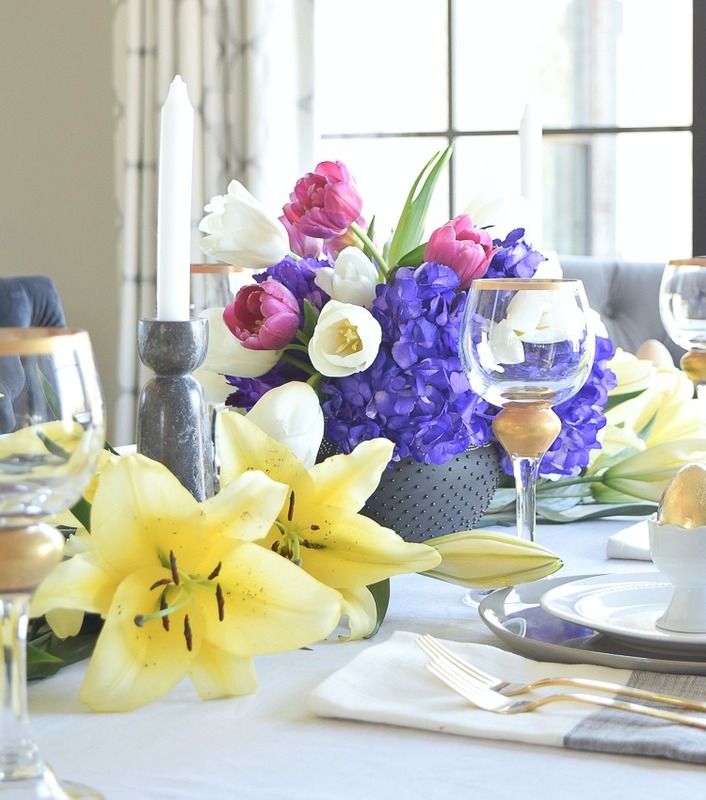 For spring in the dining room, a light weight throw and some tulips in clear vases line the table plus I added these fun pillows in a modern floral! 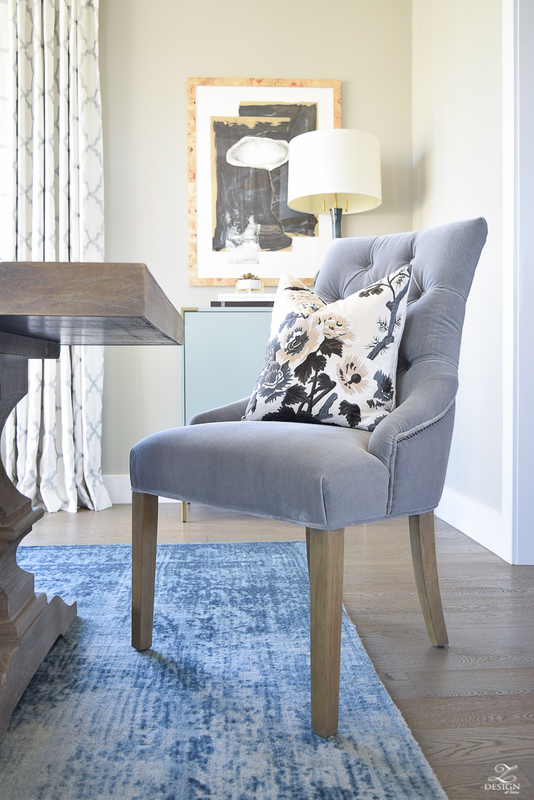 Can’t even tell you how much I love the neutral print but I really love the subtle hint of blue in it that picks up on the blue in my all time favorite rug! I also added this fun art from Minted and frame from Framebridge for spring and Framebridge is offering my readers 15% off with code ZDesign through May 31, 2017 so don’t miss it if you have a project coming up soon. 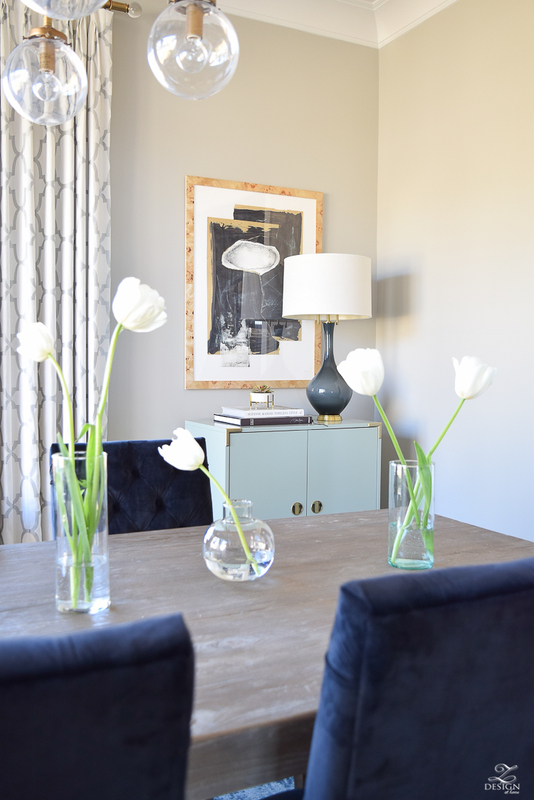 In this post about my spring art updates I also included several simple tips for hanging art that you might want to check out for that project. 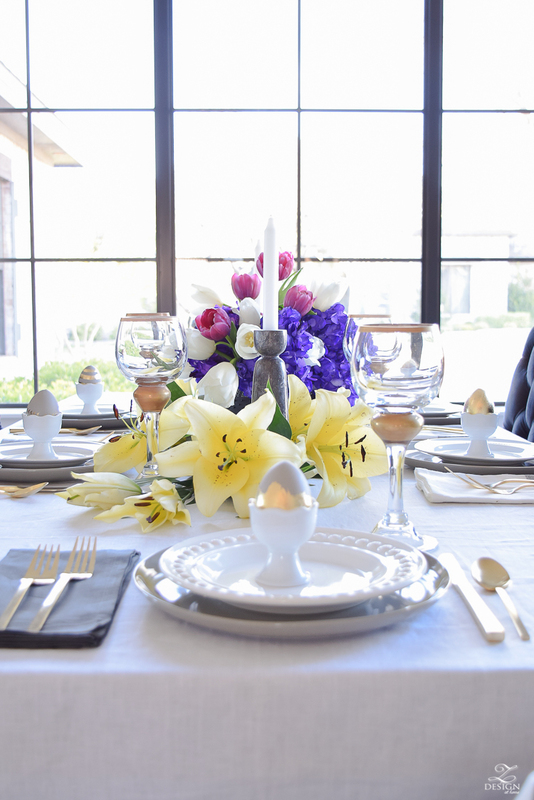 I also did an Easter entertaining tour in the formal dining room and you can catch it all here. 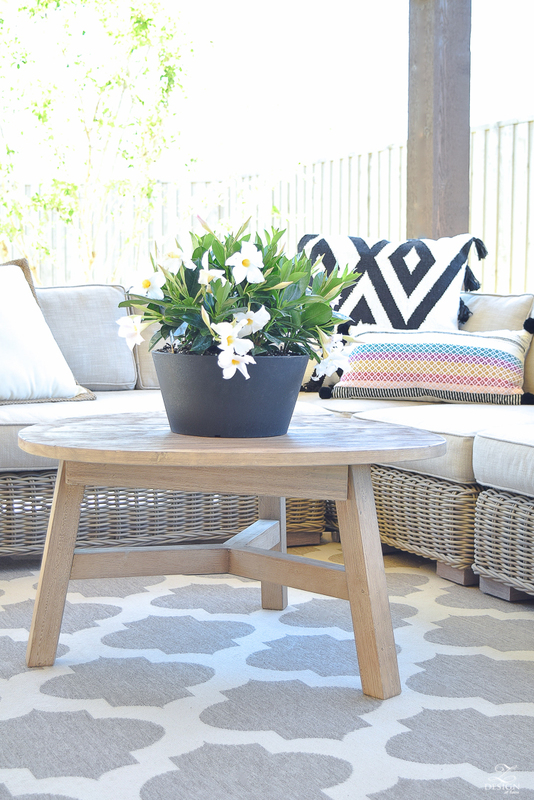 Moving on to our spring living room…I honestly don’t think I’ve loved the look our living room more! 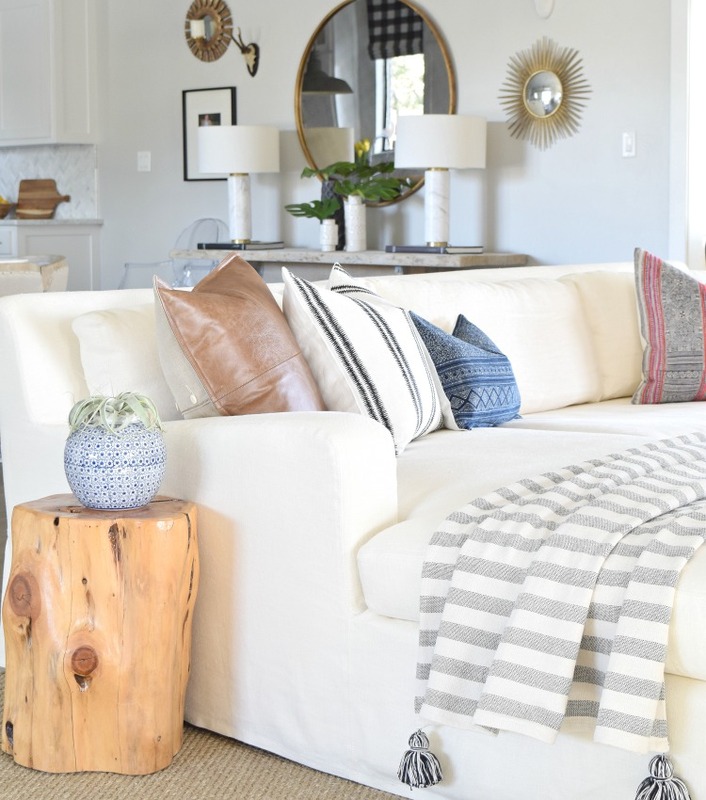 I’m still completely smitten with the pillows I selected for my spring collection (here, here & here-similar) this year and the throw I found to drape over the chaise part of the sofa. 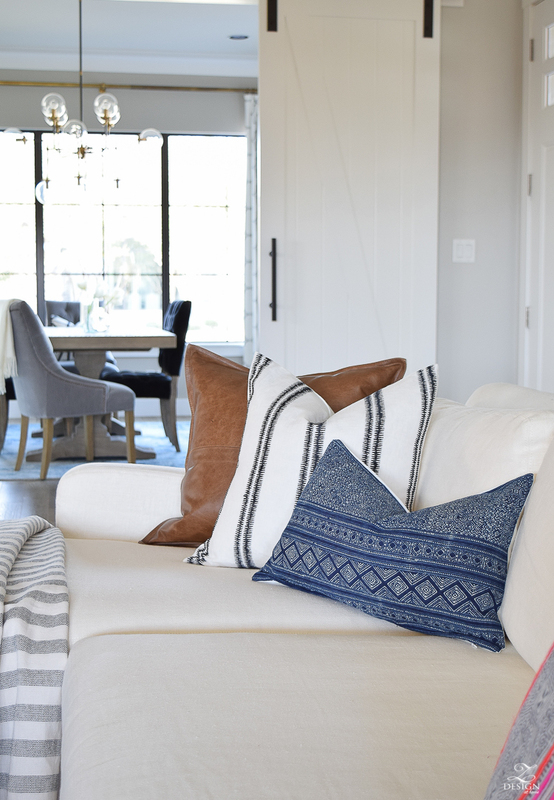 The updates were simple but gave our living room a fresh, modern vibe that I had been craving in here for a while. 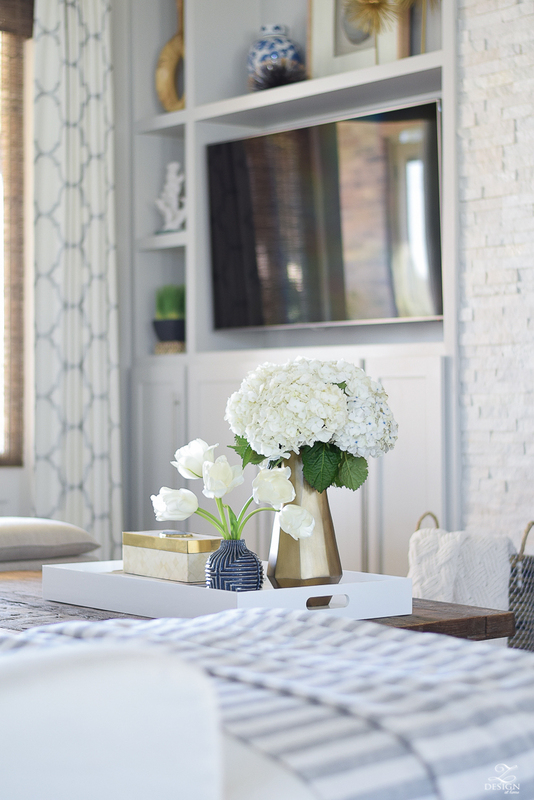 The coffee table and shelves surrounding the TV received simple spring flowers, a fun new vase, and items came out of my decor storage closet to complete the look. 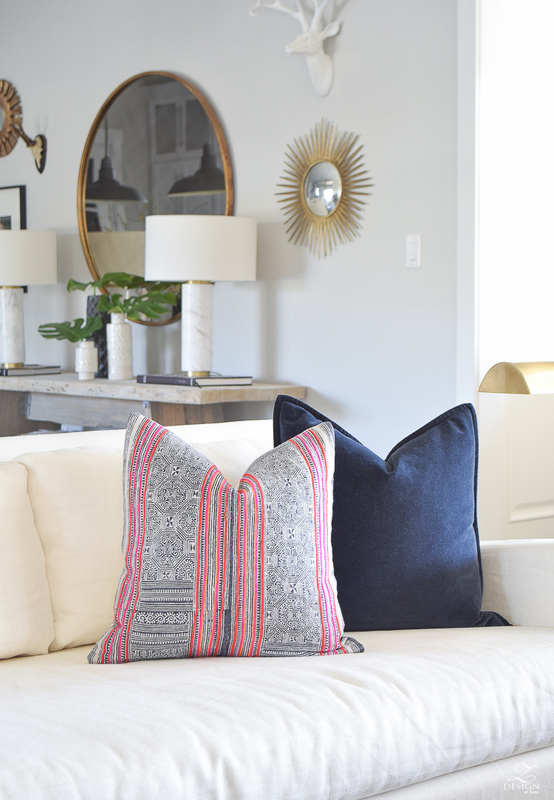 I Love the patterned blue vase so much and love how it picks up on the blue in the new pillows (the vase comes in several colors). Also love the bone inlay box with a simple agate piece on top to add a pop of color (similar here & here). 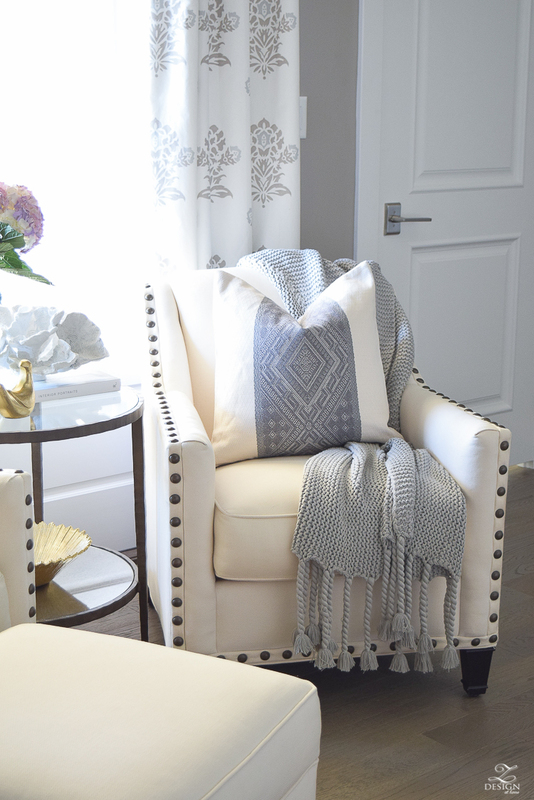 After this spring tour and in my post about how to update a traditional chair, I shared how to bring an older and/or more traditional chair (my chair here) into the modern world with some simple, modern updates and today this is how this side of the room remains for a fresh, spring look. You can catch that post here. 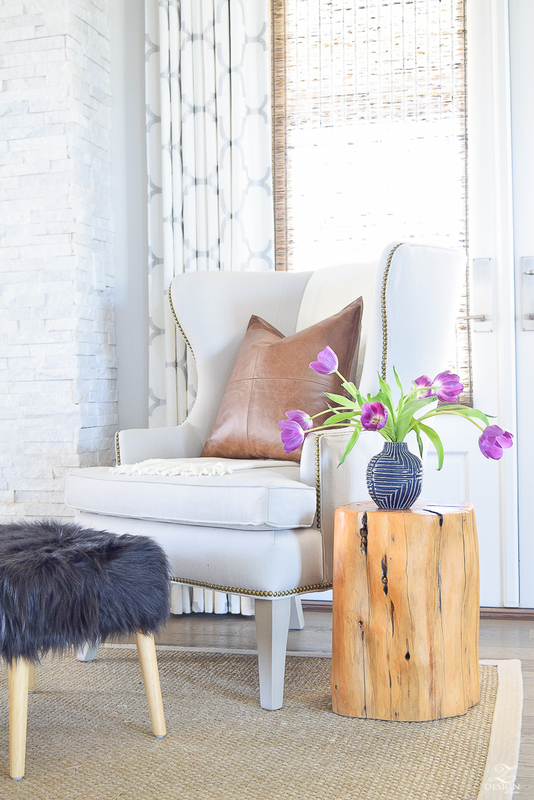 My favorite item over here is by far the leather pillow…all the heart eyes for this one, friends!! 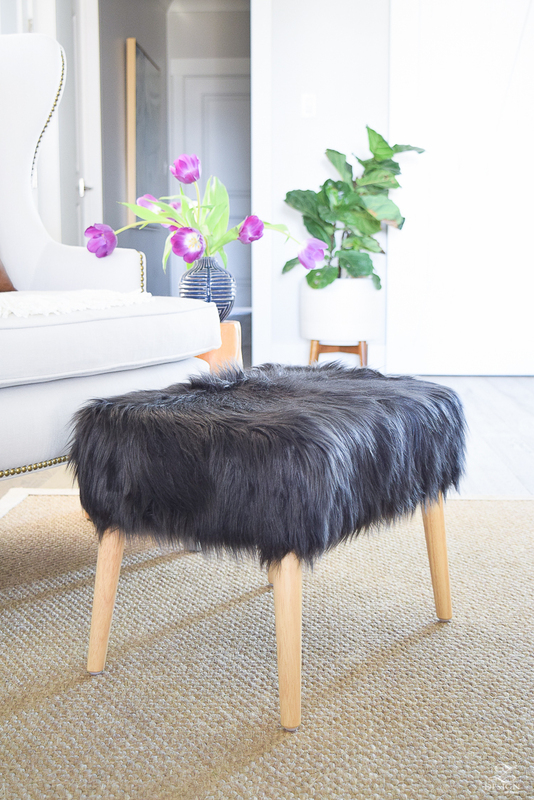 I’m completely over the moon with this black fur stool for spring. Even if you might be afraid of using black in your home, don’t be!! 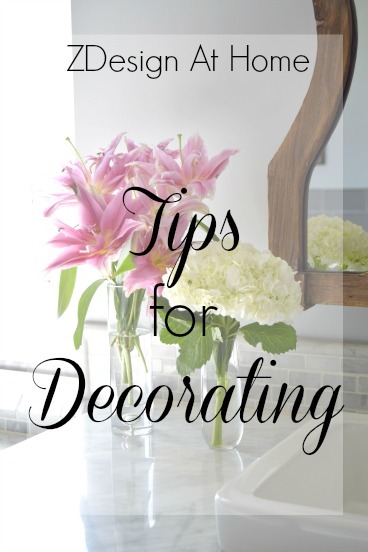 It can bring so much life, contrast, and interest into a space if done in small pops and can truly help to ground a space that your eye will enjoy! 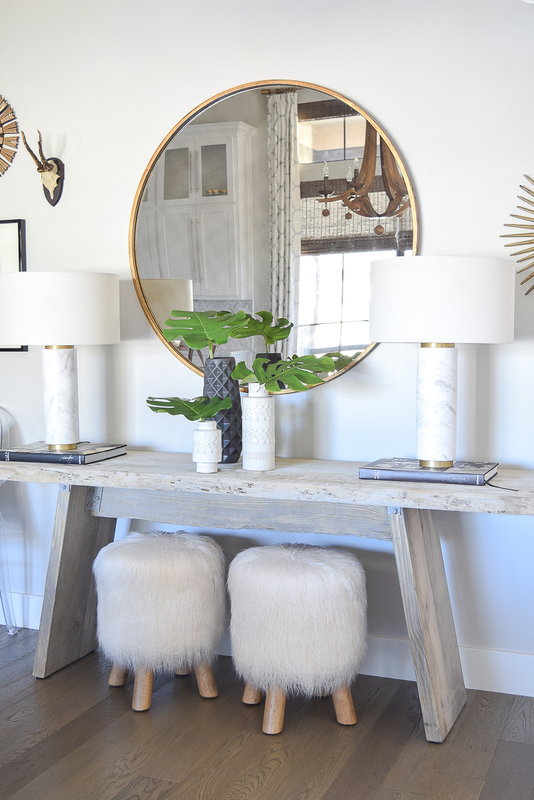 Moving on to the breakfast area…I love this collection of vases (another pop of black here in this vase), the marble and brass lamps are a favorite and were perfect to lighten this area up a bit for the spring season. Also moved my little fur stools over to this area and am loving them for extra seating when needed since this area is adjacent to our breakfast table. 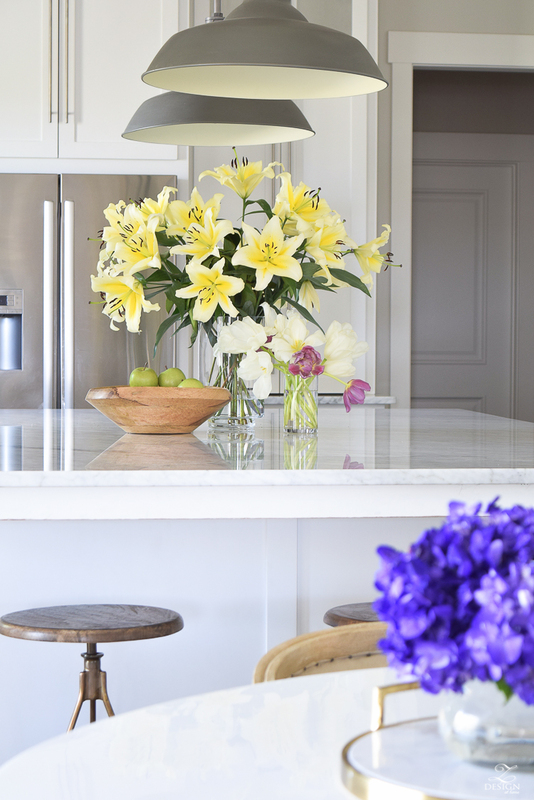 My spring kitchen and breakfast area (a full tour can be found here) evolves daily with whatever fresh flowers are available at the market but these were held over from my Easter table this year (you can see more of that here). 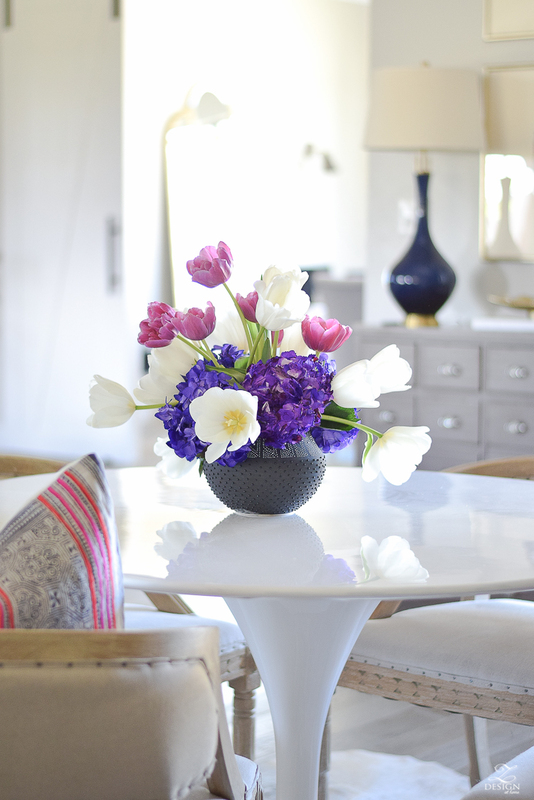 I really love the mix of hydrangeas and tulips in the black pot (found here) too. And there I go again with the pops of black! When the tulips died out I was left with the purple hydrangeas for a little while that we continued to enjoy on our table. 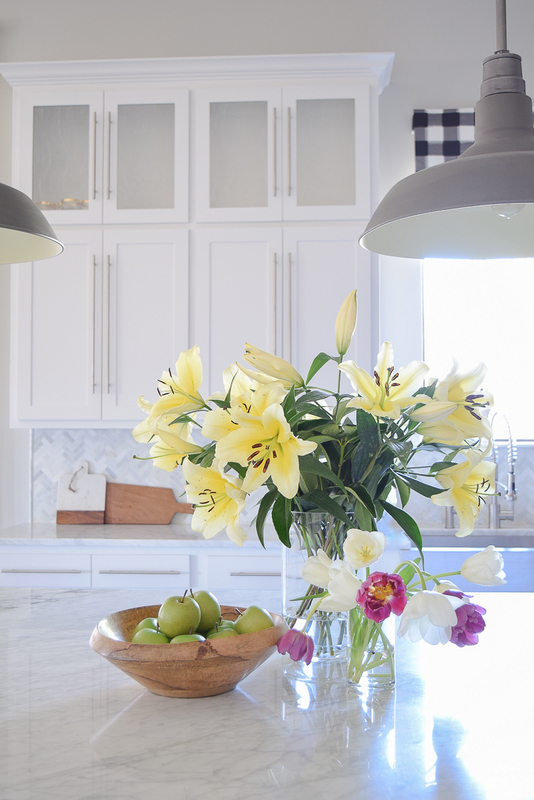 The lilies in the kitchen were so fragrant and were enjoyed for about a week and a half. Makes me so happy to walk through the kitchen and see these…I mean who wouldn’t be happy seeing this every day?! 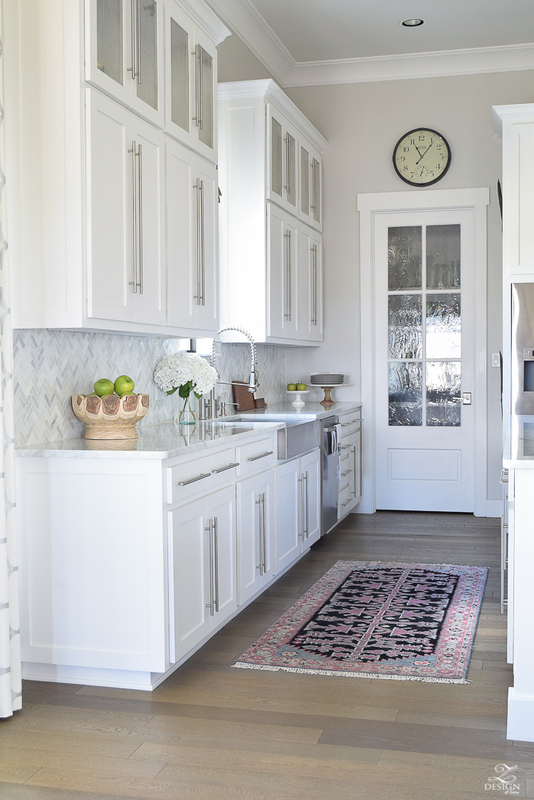 In my tour where I shared my full spring kitchen (here) I shared about a new rug that has been perfect for that perfect pop of color in here (not to mention relief for my feet at the end of a long day!). 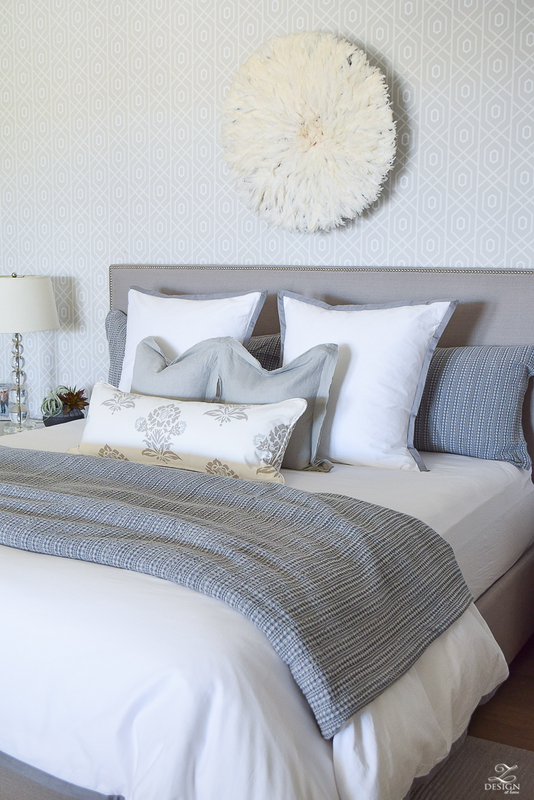 Moving on to the bedroom…I did a simple update with my bed linens to lighten things up in here that we are really loving. 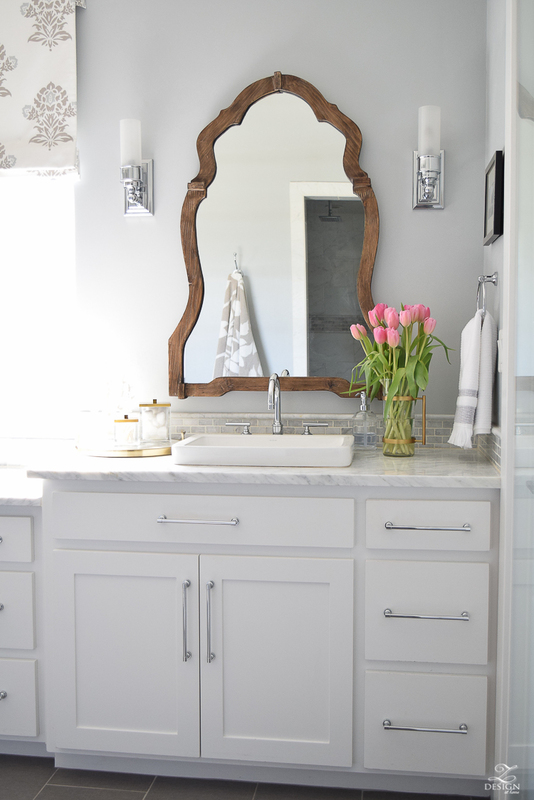 In a full post of the bedroom and bathroom, I shared 5 simple tips for a spring refresh of the master suite and you can find that here to get caught up. 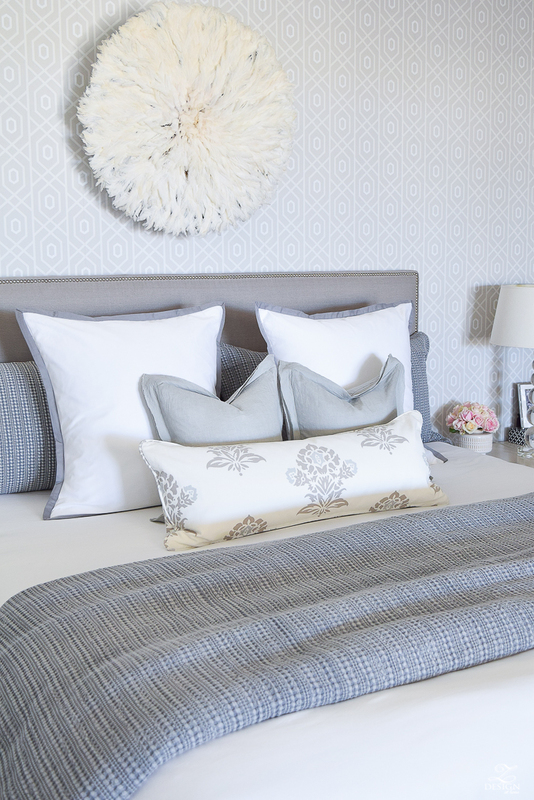 I am smitten with the new honeycomb duvet and shams, and especially the new pillows in our sitting area! Also loving the Juju hat over the bed and you can find more on that here in an art updates post. 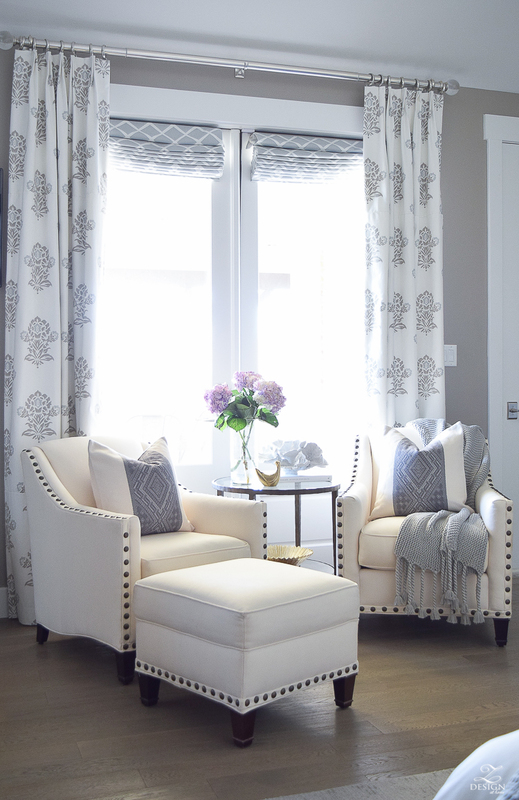 The sitting area received simple updates with these new pillows in the chairs and spring accessories came out of the closet to update the side table. I also pulled out a throw I’ve had for years that always stays in style (similar here). 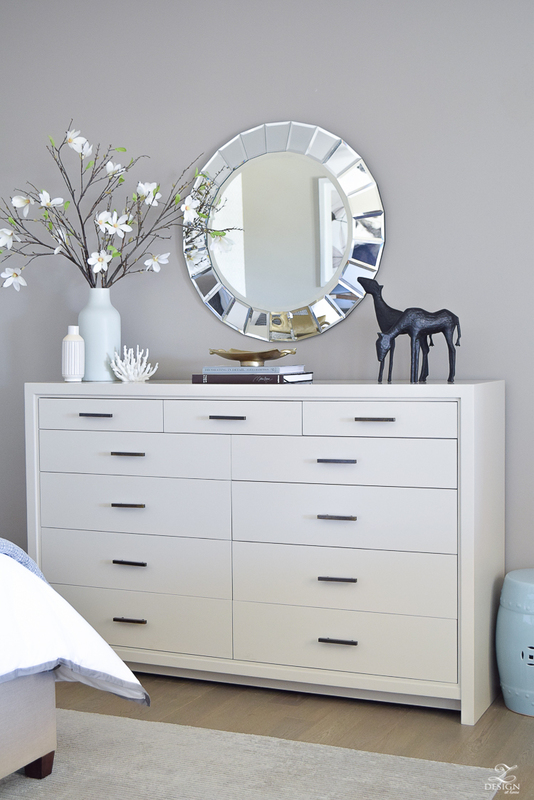 The dresser received spring updates with items from my decor closet and from around the house. 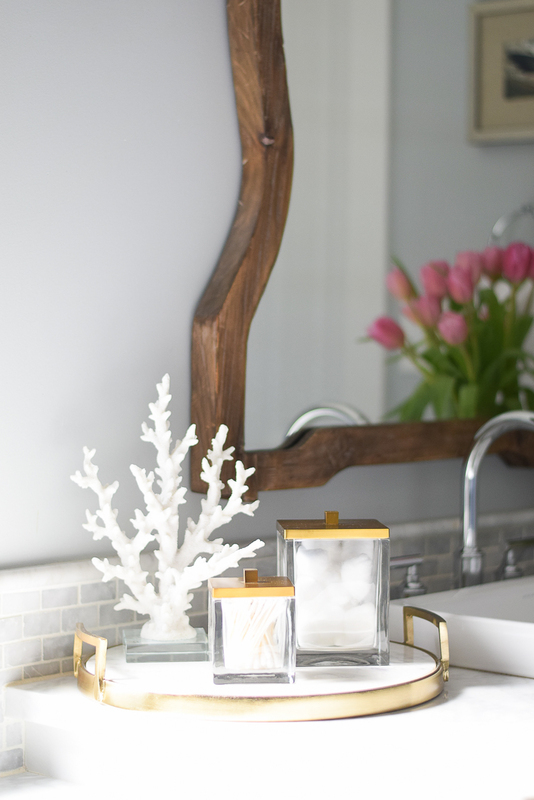 I love decorating with large books and love the addition of the gold tray for spring (similar here). Everything else pretty much stayed the same except for the small white vase that is a favorite in my vase collection. 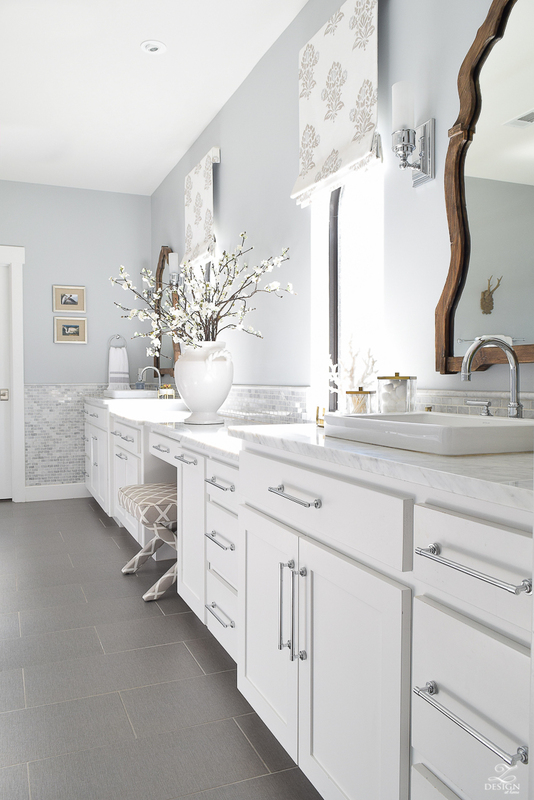 Moving on to the master bath now! I was in desperate need of some pretty canisters for cotton balls and q-tips so I added these to my vanity along with bringing out some coral as I always do this time of year. I’m loving the pops of gold in here to create a nice eclectic mix in this space along with the coral which brings in that spring touch. Don’t ever be afraid to mix your metals as it always makes for a more interesting view! 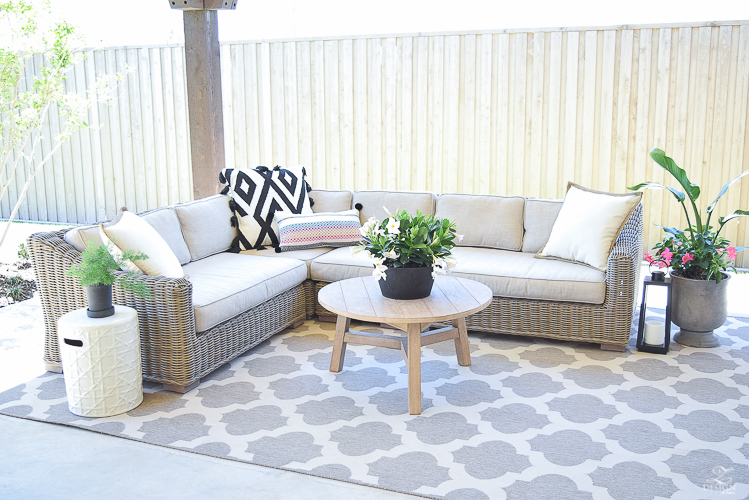 And last but not least I finally got around to doing something with our outdoor space. We’ve had much warmer temps lately and have really enjoyed this space this year so far. I pulled out some existing pillows and planters and went to town when it came time to decorate out here. 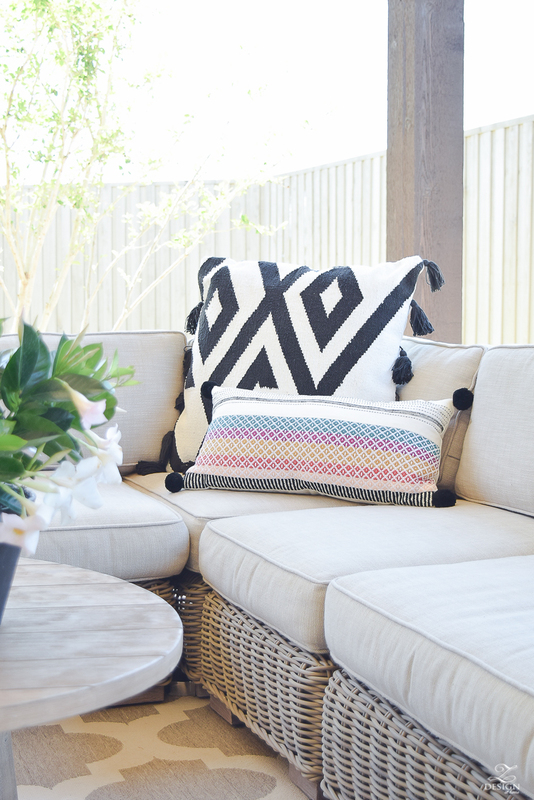 The only addition are these super fun fringe and pom pom pillows in black and white with a small pop of color (and a couple of cute planters)! I found these beauties at Home Depot and have never used them before on my patio but they are called Dipladenia. I also got some of these in pink and you’ll see them in a moment. I found this great pot by Smith & Hawkin and love it because well, it’s black but it’s also recycled, has drain holes, and is self watering. Simple but functional which is always good! 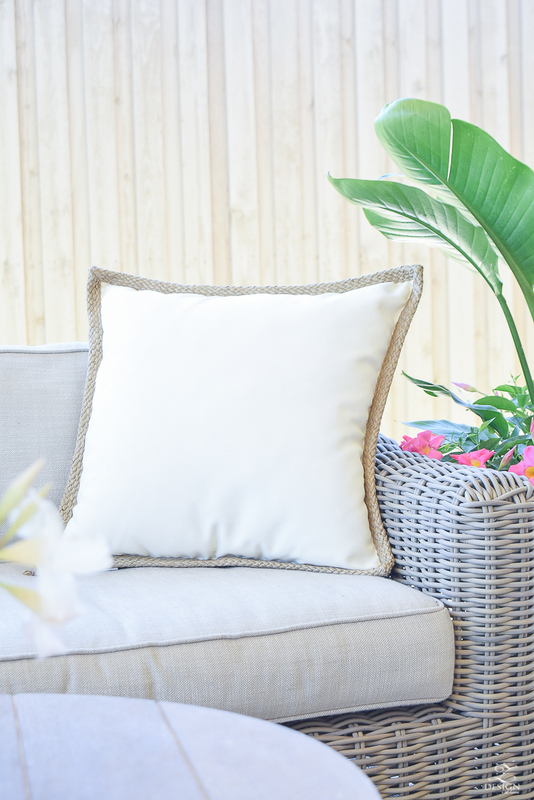 Additionally I pulled out my favorite indoor/outdoor pillows with synthetic trim. These are the absolute best outdoor pillows because dirt and water just roll or brush right off and they go with anything. 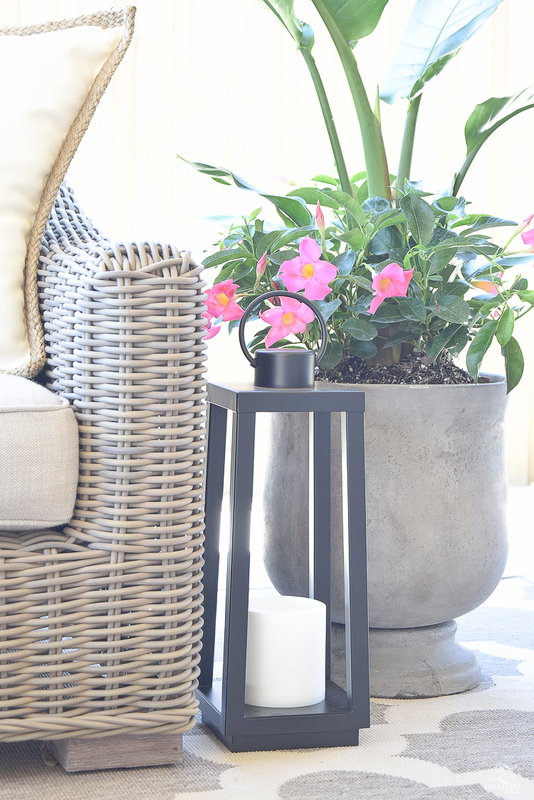 I also added this cute self watering black pot to go on the garden stool (similar here) next to the sofa for a pop of color with a asparagus fern (similar sofa found here). 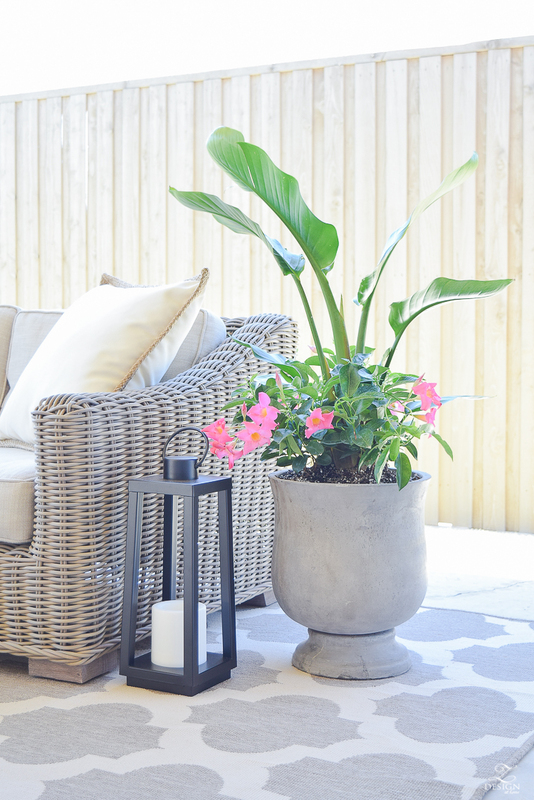 More pops of color with pink Diplandenia in my favorite pot (similar here) along with a lantern. Love this lantern because it has a built in candle for those times when we sit out here past dark and it’s always windy here so I don’t have to worry about a candle being blown out. Normally I have two hibiscus trees behind the sofa to buffer the view of the fence but I just haven’t quite gotten to that point yet this year! The hibiscus trees makes a huge difference that you can see in my patio tour from last year here but for now this will have to do. I’m waiting for Easter to pass before I include them in my outdoor space just to make sure we don’t have a freeze that will kill them first! Well friends, this concludes my final spring tour of 2017 and thank you for stopping in to check out the Spring In Full Swing Tour!! Next up in the line-up is the super talented Brittany of Addison’s wonderland and I hope you’ll head over to her lovely spring home from here and then later on be sure to visit the other ladies in the group. 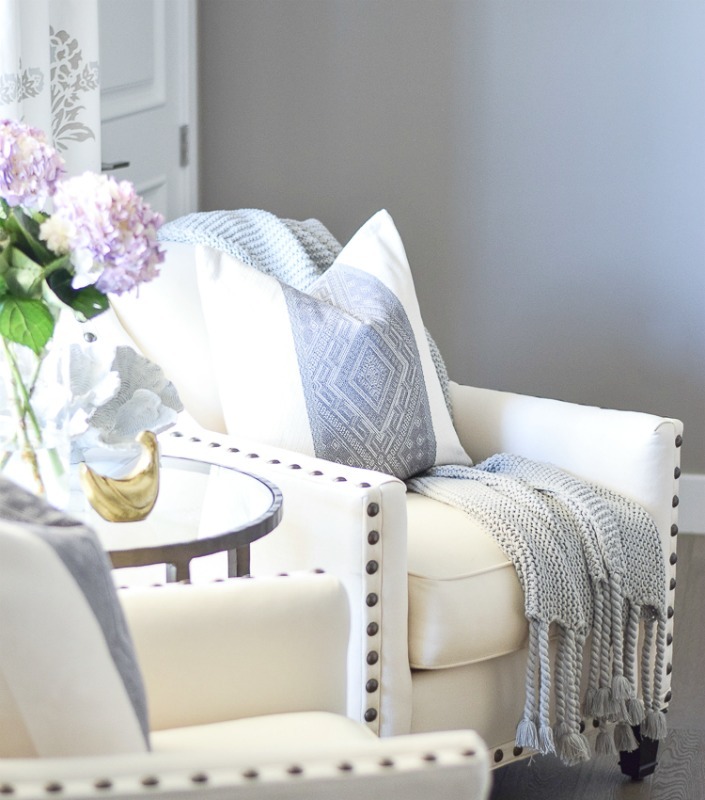 Each talented blogger has a beautiful spring home to share with you today and I know you will love every bit of inspiration each has to offer!! LOVE everything, Bree! 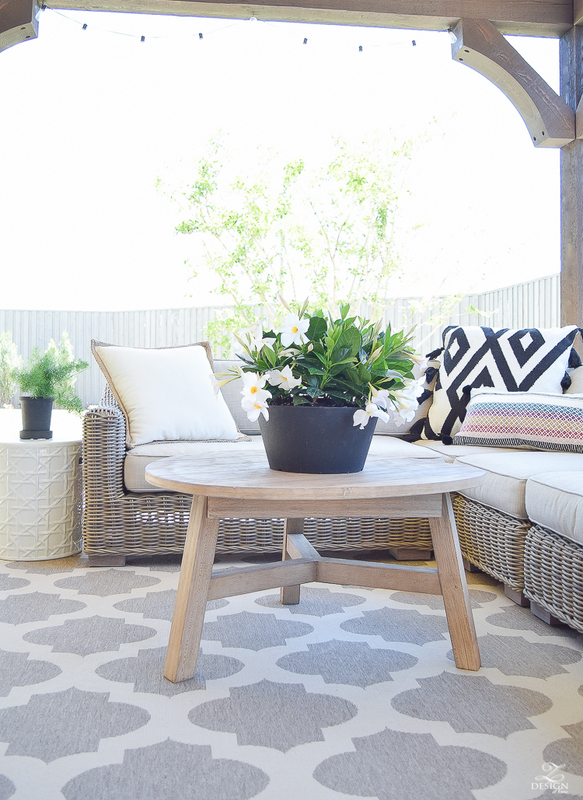 Your outdoor space is fabulous! 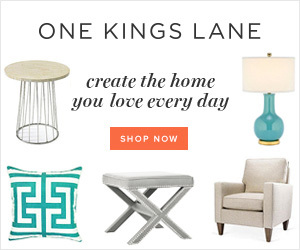 Love all of your new pillows!! 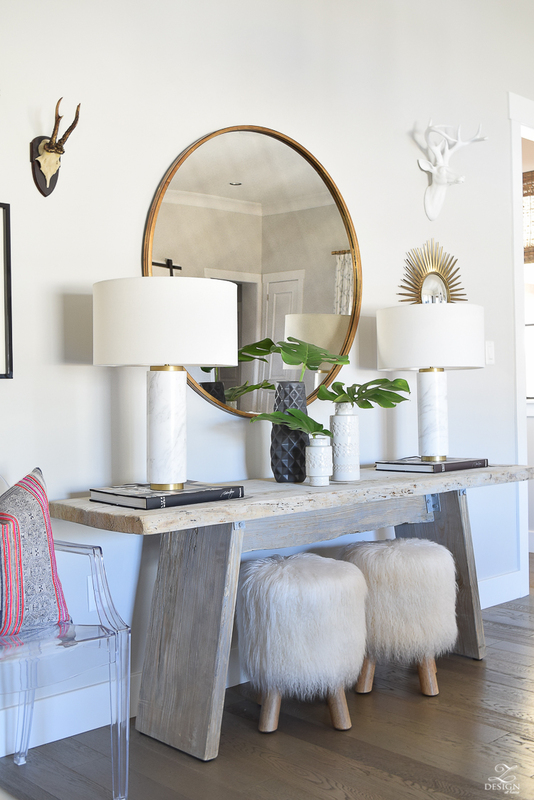 Bree, your entire home is just gorgeous with all of your Spring touches throughout – I just love all the thoughtful details in each and every space!! 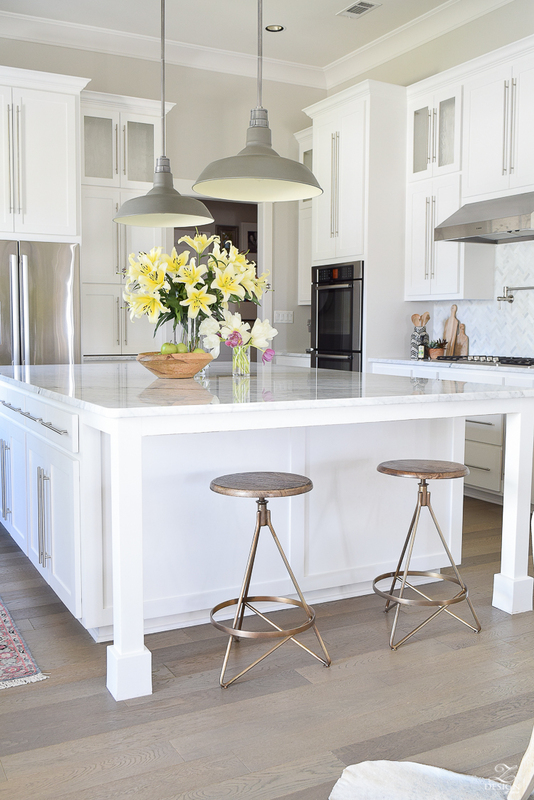 Your dining room is still one of my favorite spaces ever and I love those new kitchen stools too! Happy Spring!! Your home is beautiful! I aspire my home to look like this someday! Where is the round gold mirror from? Thanks! I love your home. Just beautiful! 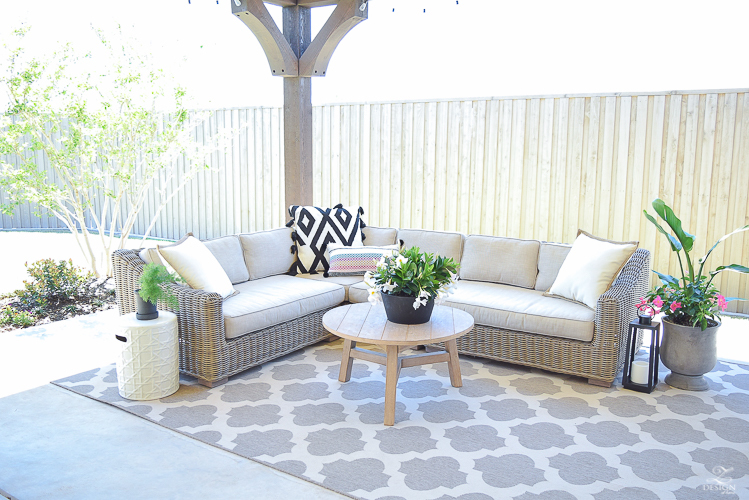 I am looking for a rug just like your outdoor rug. The links you have are not quite the same rug. 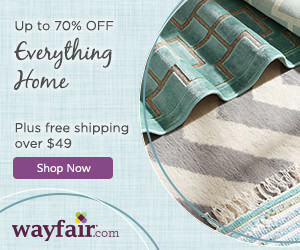 Would you mind sharing where you got your rug? Thanks so much!